Patricide, matricide, a brother and his sister reunited after decades but then forced to part: the story of Electra and her brother Orestes features in plays by three of the leading Greek dramatists. 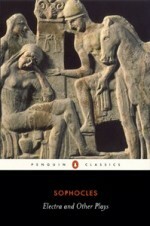 The only version I’ve read is by Euripides so I can’t comment on how it compares to the plays by Sophocles or Aeschylus. The framework of the story is straightforward: on his return from Troy, Agammemnon, King of Argos was killed by Aegisthus who then married the widow Clytemnestra. Her son Orestes was secretly sent abroad to keep him out of harm; her daughter Electra was married off to a peasant. After 11 years or so in exile, Orestes returns determined for revenge and tracks down his sister. The two kill King and Queen but instead of being rewarded for their actions, retribution awaits them in the shape of Zeus’ twin sons. Orestes is despatched to Athens to stand trial and his sister is married off to his best friend and told the leave Argos. This approach means it’s hard to relate to either character. Euripides could have posed an interesting question – what makes a person kill, not out of sudden burst of anger, but out of a desire for revenge harboured over many years. But we don’t get to see that question played out or much real debate between the two offspring about the reasons for their murderous intent. Electra seems just as determined as her brother to exact revenge yet, the play shows that at the final moment she drops the sword and it’s Orestes who steps in to kill Clytemnestra having already seen off Aegisthus. Why Electra fails at the exact moment when she supposedly is about to fulfil her desire, is never explained. This was the second play by Euripides I’ve now read as part of my Classics Club list. After the passion and drama of Medea, my expectations were high for another explosive drama but all I encountered was the literary equivalent of a damp squib. Posted on November 28, 2012, in Classics Club and tagged Euripides, Greek drama. Bookmark the permalink. 1 Comment.